The Pegasus series continues with its 34th iteration. 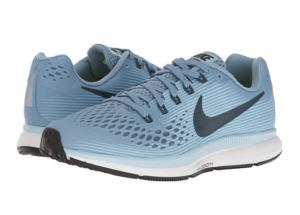 The Pegasus 34 is generally a great upgrade from its predecessor. 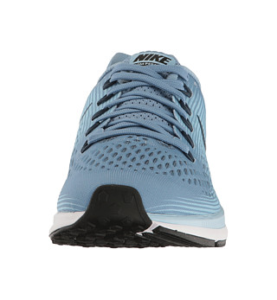 It is very comfortable, good looking, a lot more breathable, and has great responsive cushioning. 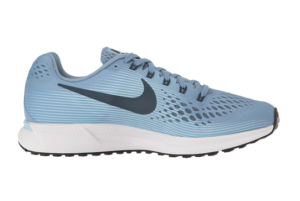 A new design of Flymesh, for lightweight durability, is introduced by Nike Running and the shoe maintains the well-known forefoot and heel Zoom Air units for versatile performance. 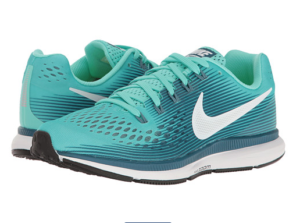 The Pegasus 34 offers a lighter and cooler look with a durable and long-lasting comfort and stability. There are more interesting colorways to look at in the women’s lime, with blue, pink, grey and black to choose from and they all fit in with the dynamic lifestyle. The shoe gives a springy feel underfoot. Effectively keep the feet cool during long running in the Summer. 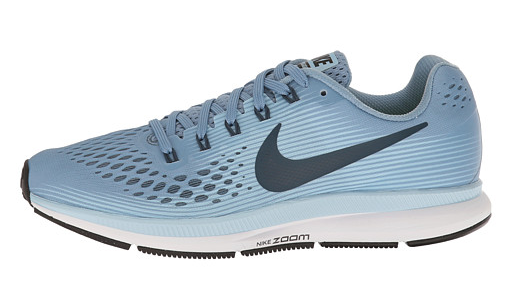 Responsive cushioning from Zoom Air units. Smooth transitions for longer and more comfortable running. Fitsole sockliner gives stable and solid support. Nice colorways for the Summer. Flat laces can stay tied better. Some don’t like the perforated front foot look. Some users prefer the subtle look of the Nike logo and the logo on the side of this shoe can be too big to them. A couple of users are disappointed by its cushioning. 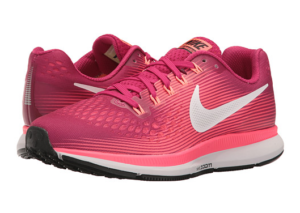 The latest version of the Pegasus series, the Pegasus 34, has been presented to the market. The new version is upgraded with noticeable breathability, thanks to the new design of the Flymesh upper. 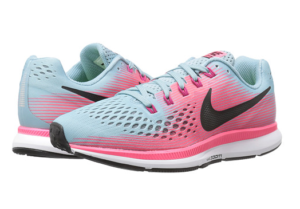 Runners who have been running in Pegasus are also impressed with the balance from the heel to the toe which is well controlled and centered all the way during the run. 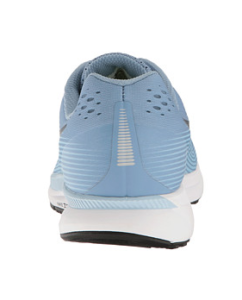 Runners are also happy with the sneaker’s firm heel counter. It provides a feel of better lock down in the heels. The heel cap stays in shape over time. The switch into flat shoe laces from the previous round ones also make them stay much better tied. The outsole still maintains good traction and is grippy on various surfaces. The addition of the reflective elements also helps runners to run at night. The sneaker is good for long and slow-pace runners and it is also good for training or tempo runs as well. 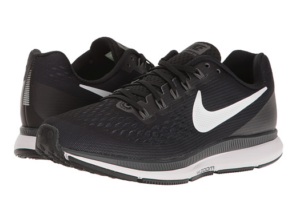 Long-term runners expect to get around 400 or 450 miles from this shoe. The sneaker is generally true to size. The Flymesh gives a breathable and wrapped feel all over the feet. Its Dynamic Flywire cables in particular wrap the arch of the foot for snug support and a secure, locked-down feel. The shoe is flexible and comfy; To some users, the shoe is a bit stiff in the beginning, but can be broken in very easily. The shoe comes in medium width, but not extra width. Therefore, users with wider feet may find the shoe not too accommodating. The shoe introduces seamless Flymesh fabric, which is lightweight and breathable, to help reduce overheating for cool, lasting comfort. Premium Cushlon foam and Zoom Air in the forefoot and heel create a responsive, springy feel underfoot. The outsole is designed to distribute your weight more evenly for a smoother ride with enhanced traction and durability. Rubber crash rails on the lateral outsole helps promote smooth transitions.